FRESHLY PAINTED (exterior ) Post & Beam Colonial on an 1 acre of land has two additional out buildings, one used as a garage and one used as a workshop. Enter front door, and go through french doors to large living room w/ hardwood flrs. & pellet stove that leads to Kitchen with upgraded Refrigerator /Freezer, Dish Washer & Stove fueled by propane. Heat is forced hot water baseboard fueled by oil furnace.Large room when entering back of home that could be large mudroom or kitchen table area. Dining room next kitchen w/ hardwood flrs., wainscoting & a built-in shelving unit. Upstairs boasts a Large Master Bedroom w/ restored hardwood floors, double closets, & storage area. . Buyers to due all due diligence. All measurements are approximate. Passed Title 5 report states use for 3 bedroom. Public records states home is 3 bedrooms / Field Card states home is 3 bedrooms. Current owner using home as a 2 bedroom. 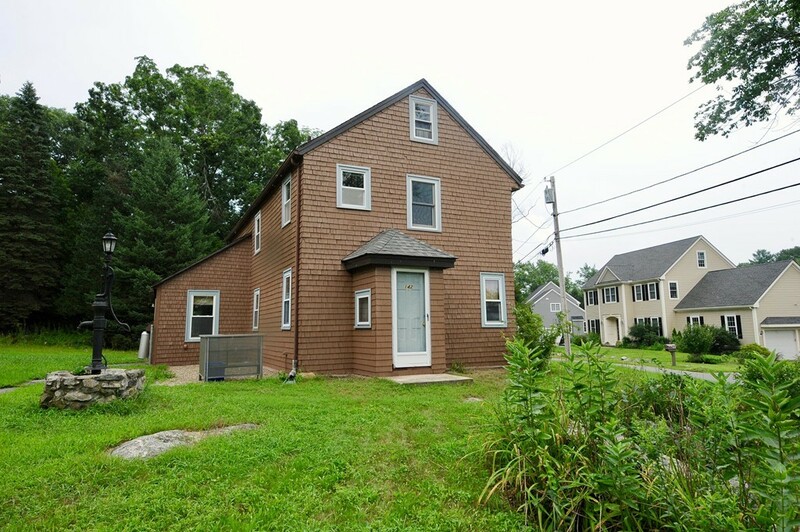 Wonderful home at a great price point in North Andover. Of Barn That Is Dismantled.